Believe it or not, this machete has two distinctive features going for it, and both are actually great in practice. First, the Black Steel Jungle Machete has a wicked and useful blade. Second, it has an exceedingly vibrant bright neon-green handle. Now, the first point seems pretty self-explanatory. The blade is made from black stainless steel, features a clip point and a gentle curve, and has both a gut-hook and serrations on the back edge. 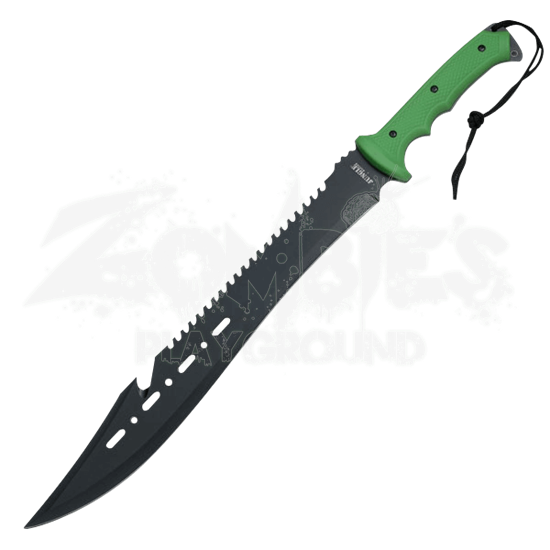 It slices, it dices, and it stabs with exceedingly efficiency, and that makes it a great zombie slayer, while the added features on the back make it a solid survival tool, as well. 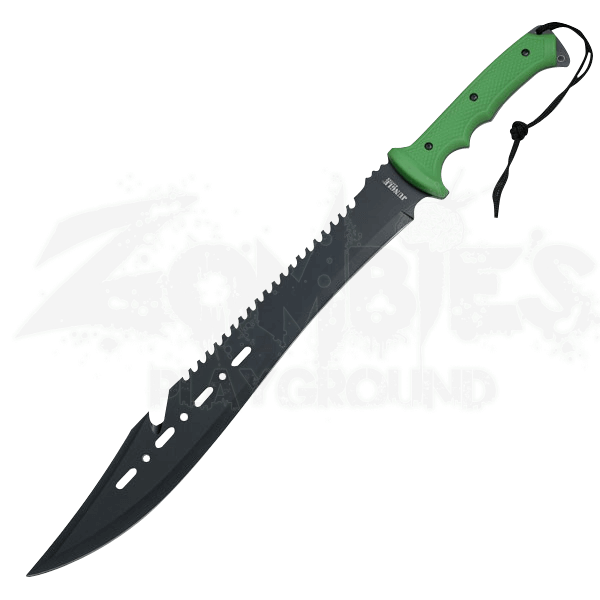 But the bright green ABS thermoplastic handle serves a purpose too, and not only does it make this machete comfortable and easy to handle, but the vibrant color will help you to stand out to human eyes, ensuring that fellow survivors will catch sight of you easier! Clever, no? The machete includes a nylon sheath, which makes it easy to store away safely as well as a cinch to carry around. Do not leave survival to chance. Take every advantage you get, so pack this Black Steel Jungle Machete along for the journey, and use it with gusto every time one of the walking dead get too close for personal comfort.